Modern Mommyhood author Rachel is a freelance writer and mom from central Pennsylvania who's been blogging for seven months. Says Rachel, "Modern Mommyhood is all about making the most of your time as mommy by learning from other moms, finding new ways to stretch a buck, and exercising your creativity." First impressions are important. What do you think about the site's overall design? Easy to navigate? What about the content? Sometimes I feel like the name Modern Mommyhood tells people I am a resource for mom rather than a personal blog about my own experiences. Is the subject matter focused, or does it look like I blog about too many different topics? I am thinking about making Modern Mommyhood more of a resource for moms, by moms (not just about me) because I feel like that's the direction it is going. I'm considering taking on a new blog for myself. Is this a wise idea? Any other advice would be wonderful! 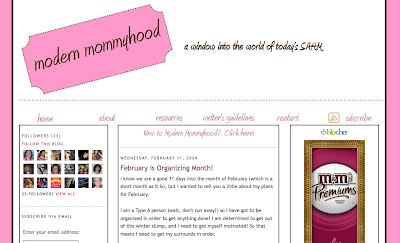 BlogCoach readers, take a look at Modern Mommyhood. What advice can you give Rachel?